Earlier this year, Elsie said she didn’t need to go to school next year because she already knew everything. I hoped she wasn’t paraphrasing something she’d heard me say. At the time and since, I did my best to explain what school is and what she’ll learn and the fun she’ll have. Thinking back to my own school days, I have a couple of really vivid memories and not much of anything else. We learnt to tell the time on a handout that had a dozen or so clock faces drawn on it and my best friend and I gave the same wrong answer for one of them. When the two of us faced the class to own up to who copied who, my friend said I’d copied her when it was the other way round. Right then, the lesson became far more than just how to tell the time. Perhaps earlier than that, the class had to colour in a picture of a car. I coloured the windscreen yellow rather than leaving it clear—I knew my bus mate would colour hers yellow and I didn’t want her to feel stupid when she saw mine and realised that a windscreen should be clear. On the way home we lay our handouts on the seat between us and I saw that her windscreen was clear. She asked why I’d coloured mine yellow when glass was actually clear. That lesson was more than a colouring-in exercise. Perhaps I didn’t explain what she’ll learn and the fun she’ll have at all. I handed the form in this week and told Elsie about the upcoming transition days, what would happen, who would be there and how she’ll be able to see what school is like. ‘How cool is that?’ I finished. 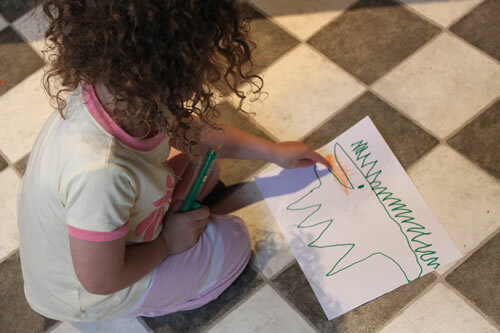 ‘Now I’m going to draw his teeth,’ she answered, looking down to finish off her drawing of a crocodile. Was that a subject change? Did she not want to talk about it for some reason? Or had we talked about it enough and as far as she was concerned the conversation was over? Did she think mine was a rhetorical question? When Elsie was only two I learnt that there were going to be times in our children’s lives when we think something is a bigger deal than it is, and a bigger deal than they think it is. Times when we expect that they won’t manage as well as they do. I decided she shouldn’t have a dummy anymore. She’d been placing them on her pillow each morning when she got up, then, when she went to bed, one went in her mouth and the other she held in her hand. I allowed her to have them for another 6 months while I figured out how I was going to do away with them, justifying the thinking time by telling myself that she only had them at night and that she was still only two. I read and I asked other mums. I explained to Elsie (as one mum had done) that we could put the dummies in an envelope and post them to the dummy fairies, who give them to babies who need them and the fairies leave you a gift in return. I got so confused by my explanation that I lost her at the part about putting them in an envelope. In the end, I bit the bullet and told her as we drove home from our holiday that we must have left the dummies back at the holiday house. That night as she hopped into bed she asked where her dummies were. ‘Oh. I miss my dummies,’ she said, then rolled over and went to sleep. I liked that her reaction was based on temperament, with a resilience and innocence untouched by challenges and experiences with clock handouts. I decided then always to give her credit, never to assume a reaction and never to think something’s a big deal when it may not be. I never knew having kids would teach me so much. Afterall, I knew everything. Oh wow! Larissa you do have a wonderful way of expressing yourself! I just smiled all the way through that…not surprised you got yourself confused with the dummy fairy story!!! Never heard of that one! It sure made a good story though.I take it she is a “chip of your block” then? Love it…and I love you and Anthony and the girls.